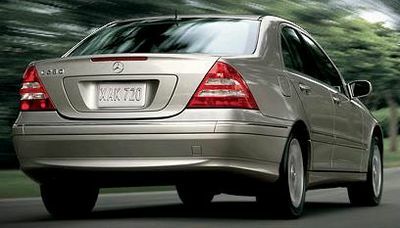 The Mercedes-Benz C-Class was produced as an entry-level luxury sedan. While not too overly expensive, the C-Class offers everything “Mercedes” to the consumer. From stylish and classy looks to exciting power and performance, the C-Class is all that Mercedes are known for. In addition, with three engine types to choose from and many accessories, the C-Class caters to any buyer’s needs. While Mercedes continues its luxury tradition with the C-Class, they are also taking great steps to make the C-Class into a that provides a driving experience that competes with other sedans in its class. And with all the sport models available, they are getting close. See also the main fact sheet for the Mercedes-Benz C-Class. More exciting driving experience can be found on the BMW 3 Series. The least powerful of the C-Class engines, the 2.5-liter V6 in the C230 Sport sedan, rated at 201 horsepower, offers more power than the supercharged four-cylinder engine it replaced. As important, it is far smoother at all speeds and generally less course in feel, sound or the amount of vibration it generates. The 228-hp 3.0-liter V6 in the C280 Luxury sedan is much more powerful and satisfying than the anemic 2.6-liter V6 in the 2005 C240 (previously the best selling C-Class). The 3.5-liter V6 in the C350 generates 268 horsepower, which improves acceleration performance considerably. Matched with either the six-speed manual or the high-tech seven-speed automatic, the engine makes the C350 more responsive. The 3.5-liter V6 has fully variable valve timing to deliver an impressive amount of torque from idle all the way to the redline. The C350 responds more immediately than the C320, no matter how fast it's already traveling when the driver presses the accelerator. The new engine is also noticeably smoother, particularly at high rpm. And thanks the seven-speed automatic, the improved performance comes without a corresponding decrease in fuel mileage. All of the C-Class cars offer nice steering, effective brakes and a good balance between ride and handling. Before choosing between a Luxury or Sport model, C-Class buyers should carefully consider whether a smooth ride or sharper handling is preferred because the trade-off between comfort and response changes with the model. The Sport models are more firmly sprung than the standard Luxury models. 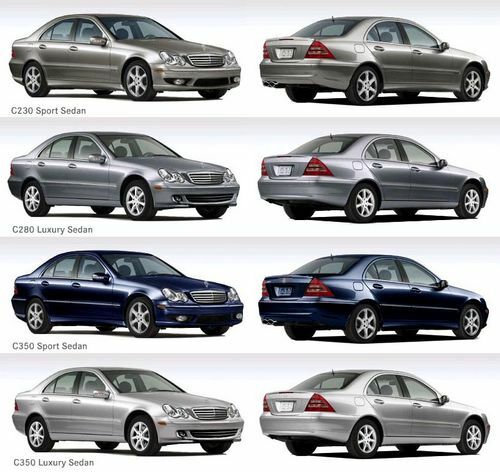 The Luxury models most closely replicate traditional Mercedes ride quality. Their ride is almost cushy, but it's well damped, so there's no floaty, sea-craft feeling over dips in the road. The Luxury models won't wilt if you push them a bit, but they're never stiff. The Sport models are livelier and turn into corners more responsively. The nicely weighted power steering, sports seats and beefy steering wheel all contribute to a feeling of better control. Indeed, if you enjoy spirited driving, the C230 Sport sedan may be the most enjoyable C-Class yet (short of an AMG). It's a bit less nose heavy and bit more spry than the C350 Sport, and its revised six-speed manual transmission contributes considerably to the fun. As mentioned, the C-Class offers a choice of transmissions. The seven-speed automatic that comes on the C280 and C350 Luxury sedans is superior to five-speed automatics that come on most cars. With more gears, it offers better acceleration performance and responsiveness around town as well as enhanced fuel efficiency. Gear changes are barely noticeable in normal driving, especially in the higher gears. This transmission allows significantly quicker acceleration for highway passing situations, and it doesn't have to go through every gear. Step on the gas and the transmission will skip down to the appropriate gear, switching from seventh to fifth, for example, and from there directly to third, meaning two downshifts instead of four. As for the manual transmission, Mercedes has lowered the ratio for first gear for quicker acceleration off the line, but kept an overdrive sixth gear for quiet, low-rev highway cruising and better fuel economy. More important, the old cable-operated shift mechanism has been replaced by a solid, direct rod. The result is easier, quicker and more precise shifting, and the improved action contributes greatly to a more rewarding, engaging driving experience. Shift effort is low, and the gears are easier to hit. For manual fans, we can heartily recommend the C230 Sport sedan. If you prefer an automatic but want a Sport model, we encourage you to step up to the C350 Sport sedan with the optional automatic. The optional 4MATIC all-wheel-drive system delivers power to all four wheels. It's fully automatic and on all the time, so there are no buttons to push and no special knowledge is needed; just drive the car. The system uses electronic traction control to vary torque among each of the four wheels, diverting power to the tires with the best grip. Even if three wheels lose traction, 4MATIC can direct power to the one remaining tire with grip. The result is better stability and improved handling in slippery conditions, with a greatly reduced chance of getting stuck. 4MATIC does dampen engine response and slow acceleration slightly, and lowers fuel mileage a bit. But for those who drive through harsh winters, all-wheel drive is worth it. All-wheel-drive sedans such as the C-Class are proof that you don't need an SUV to confidently handle rough weather. In fact, a car tends to handle better in icy conditions than a truck. All new 2007 Mercedes-Benz vehicles are covered by the New Vehicle Limited Warranty. It covers any defects in material or workmanship for 48 months or 50,000 miles, whichever comes first. The C-Class interior looks like the inside of a Mercedes-Benz should, and for the most part it feels that way, too. A model re-alignment in 2006 has increased the level of luxury in the least expensive models. Fabric upholstery and manually operated seats can no longer be found in the C-Class line. Any of the seats are very good: neither so hard that they numb the backside nor so soft that they leave occupants tired or aching. The seats in the standard luxury models are more traditional, perhaps richer in appearance, than those in the sport models. By comparison, the seats in the sport models look stark, but provide significantly more side bolstering for spirited driving. Adjustable lumbar support is now standard, meaning more comfort for the lower back. The dashboard, instruments and seats were redesigned, and materials were revised throughout. The instrument cluster features four gauges, with a chromed-ringed tachometer and speedometer of identical size sitting front and center. To the left and right of these are smaller fuel and temperature gauges. In the middle sits an LCD display with various system and trip functions. 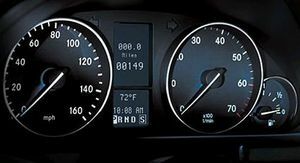 Fashioned in the mold of the larger Mercedes-Benz E-Class, the instrument cluster is deeply hooded and virtually eliminates glare on the dials. The backlit script is clear and easy to read. Audio controls are now located in an optimal spot: above the climate control switches, which sit at the bottom of the stack. Both audio and climate knobs are large and easy to locate. The lack of some of the complicated systems found on more expensive Mercedes models is, frankly, a welcome relief. The switchgear is, for the most part, easy to use and understand. The stalk controls have a beefy feel with positive detents. Redundant buttons on the steering wheel let the driver operate the audio and telephone functions without removing a hand from the wheel. The stalk-mounted cruise control continues to be an annoyance, however. It's also easy to engage the cruise control by mistake when trying to use the turn signals, a complaint we have with every modern Mercedes that comes to mind. Lighting inside is effective, with good illumination for entry in the dark and excellent map lights for reading. 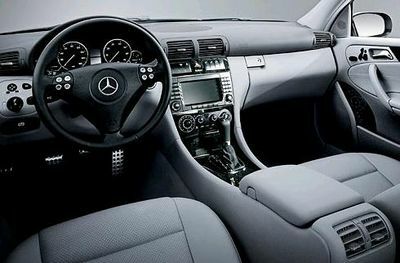 The C-Class glovebox is a good size, unless you order the CD changer, in which case you lose most of its storage space. You'll still have the center console and door pockets, but it would be nice to have more places to stash stuff. At least they've added a pop-up cupholder in the center console. In general, the C-Class sedans are trimmed with good-quality interior materials, but there are some exceptions. Some of the hard plastics don't match Mercedes' best. The sport sedans use aluminum trim throughout the cabin, while the luxury sedans use wood. The rear seat offers generous space and comfort. It's installed theater style, and sits slightly higher than those in front, giving back-seat passengers a better view forward without significantly compromising head room. Indeed, the spacious rear seats are one of the strengths of the C-Class. The optional power sunshade for the rear glass reinforces the feeling you're in a Benz. The trunk is a good size for a car this size, offering 12.2 cubic feet of cargo space. An optional split-folding rear seat expands cargo capacity. The C-Class cars look like a Mercedes-Benz should and just about everyone will quickly identify them as such. All C-Class cars sport the traditional Mercedes three-pointed star as a standup hood ornament, but even without that they'd be immediately identifiable. The C-Class shares styling themes with the larger E-Class and S-Class cars, but retains a tight look all its own. Aerodynamically, the C-Class cars are among the most efficient in the Mercedes-Benz family. The C-Class boasts a drag coefficient of 0.27, which helps minimize wind noise and improves fuel efficiency. Distinguishing between Sport and Luxury versions of the C-Class is easy. The Sport sedans have a more aggressive looking front air dam and sculpted lower cladding previously used only on Mercedes' exotic AMG models. The Sport sedans are further distinguished by a unique grille with three horizontal bars, darker, blue-tinted glass and larger 17-inch wheels. The styling for all C-Class models was freshened in 2005. The changes were subtle and we're not sure how many people actually noticed. Revised styling cues included wider set quad-ovoid headlights, more pronounced fender flares and revised taillights. The C-Class sedans are the same length as the BMW 3 Series cars, but several inches narrower, making it easier to fit them into tight garage spaces. The Mercedes-Benz C-class is available in 4 trims: C230 Sport sedan, C280 Luxury sedan, C350 Sport sedan, and C350 Luxury sedan. This page was last edited on 14 June 2010, at 07:45.